In the falling light, I thought of this, while tiny bats passed the windows — I hadn’t pulled the curtains — and I thought of it again immediately upon waking. Most days I look at the materials (and they are meagre at best) my parents left and try to think of other ways to interpret them. I’ve written queries to the places named on my grandmother’s birth certificate, tentative testings in English to people with my grandmother’s maiden name, her mother’s name. In the tiny village she came from and the small town nearby, I suspect someone sharing those names is connected to her, to me. But no word comes back. I’ve sent messages to the offspring of my grandmother with her first husband — the children and grandchildren of my father’s half-sisters and brothers — but again, little or nothing. Who were they in their daily lives? What stories did they tell? Who did they leave behind, in Horni Lomna, and Ivankivtsi in Bukovina? I want roots, yes, but also the sound a stone makes thrown into the past, echoing and re-echoing, the widening music finally including me. 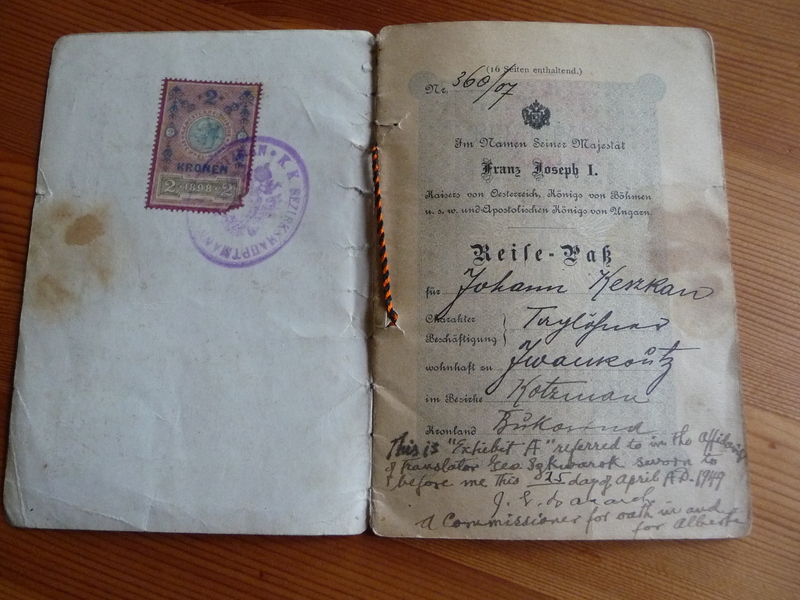 On this travel document, my grandfather’s surname is Kiszkan. ~ by theresakishkan on June 4, 2013. This entry was posted on June 4, 2013 at 3:20 pm and is filed under Uncategorized.You can follow any responses to this entry through the RSS 2.0 feed.You can leave a response, or trackback from your own site.